One of my favorite new styles of beer bars is the market-hybrid, and they're cropping up like mad. These shops sell beer by the bottle, usually with an entire wall dedicated to refrigerated cases, but also often sell pints to drink on the spot. And many have some sort of food component built in, too, whether it's a small deli counter or an entire charcuterie list, plated and served alongside a flight of craft beer. Between this kind of shop and other small restaurants specializing in cheesey foods and craft beers, I have been loving what I see. These five are my favorite beer and cheese specialty shops and restaurants in New York. Beirkraft offers an enormous selection of beers to take home or drink on the spot, including both bottled beers and draughts that you can order by the glass or growler. Picnic tables inside the horseshoe-shaped bar provide ample room for spreading out a few glasses of beer, as well as the sandwiches, cheese, and bags of chips and nuts you can buy at the deli counter right inside the same store. Check out the freezer cases for some amazing ice cream sandwiches, too. The taps rotate often. Go mid-day on a weekend, as the place closes fairly early, and enjoy the outdoor patio in the summer. ABC Beer Co. has much more nightlife than Bierkraft--it's open until 2AM on Fridays and Saturdays--while still feeling more like a sit-down deli than an Alphabet City bar. It also has bottles and taps, although I've been turned down from drinking a bottle inside the establishment itself, so be prepared to drink off the small but well curated tap list. I adore The Queens Kickshaw, a chic beer restaurant that specializes in some of the most interesting grilled cheese sandwiches I've ever tasted. Try the egg sandwich with ricotta, and a cheese crisp, and maple hot sauce. The beer selection is super, both bottled and draught, although you can't take the bottles out as Kickshaw is a restaurant and not a market. Kickshaw also makes damn fine coffee. Earl's takes the cake for being the weirdest of all the beer and cheese shops in New York. It serves grilled cheese sandwiches and a beer-cheese dip, rather than cheese plates. And they have a burrito that's disgustingly large. Earl's itself is tiny, as is its tap list (four on my last visit, which was admittedly a few months ago), and they don't sell beers by the bottle. 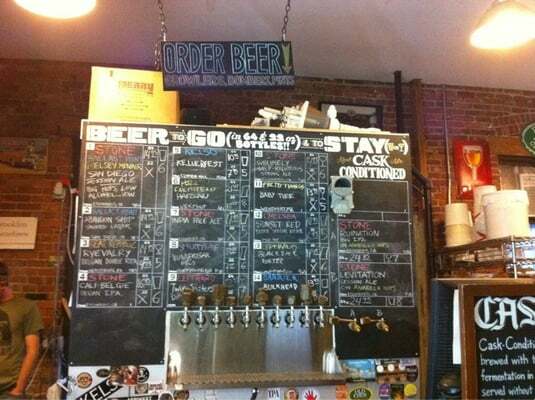 But Earl's is wildly interesting and does pick some fantastic and original beers to try. Another Astoria spot? It's true, and who would have thought it? Astoria Bier and Cheese is so new I've only been once so far, and the place still seems to be getting its legs. There's a lovely tap selection, full array of bottles to drink on the spot or carry out, a cheese and meat counter, as well as a flat-top grill and sandwich press for grilled cheese and other sandwiches. I had a flight of four beers recently ($10) that were all knew to me, a good sign of an interesting selection.